The big fights, the best fighters and the colorful characters in the world of boxing. This is the face of the robbed. Zhora Hamazaryan. Of course, the picture below is in happier times, after Zhora's win in February. But Zhora wasn't feeling so euphoric when he was made available to the media earlier this week in Philadelphia. There, Zhora, still steaming after an undeserved split decision loss to Thomas Mattice on ShoBox a couple of weeks ago, reached into his jeans pocket and pulled out a copy of the scorecards from the fight. He slammed the paper on the table; his anger was palpable. Although Zhora doesn't speak English, his actions were crystal clear to those in attendance. "I won the fight," he said, translated by Eric Rayz. "Everyone knows that I won the fight. Even the people from Showtime came over and told me they thought I won the fight." In a battle between two undefeated lightweight prospects, Zhora dropped Mattice with a beautiful straight right hand in the second round and seemingly had his way with Mattice throughout the fight. Watching the match live on television, I gave Mattice only one round, although there was another swing round that could have legitimately gone to Mattice. Ultimately, it was an easy fight to judge. Yet, when the fight ended, the scores were 75-76, 75-76 and 77-74, with two judges somehow finding five rounds to give to Mattice. Every now and then, boxing produces a result so glaringly wrong that there are only two acceptable responses to explain the inexplicable: either the judges were corrupt or they were woefully incompetent. The two offending judges from the fight, which took place in Sloan, Iowa, were Jeff Sinnett and Mike Contreras, both based in Nebraska. Although they each have judged more than 100 fights in their respective careers, almost all of them have been away from the bright lights of television: on local club shows or on deep undercard bouts for when the likes of Terence Crawford fights at home. Iowa is not a state with a strong boxing commission. The state doesn't get many fights of note and often it's more convenient for the Iowa Athletic Commission (IAC) to assign judges from out-of-state. That's not uncommon as you go across the country into lower-profile boxing states. Unfortunately, who the IAC brought in did a disservice to the commission and the state. Rulings like these will make future promoters pause before bringing their business to Iowa. Zhora's co-promoters, Banner Promotions and Thompson Boxing Promotions, have appealed to the IAC, but it's exceedingly rare for bad decisions to be overturned. Occasionally, a judge will be suspended or fired after a poor scorecard (e.g., after Williams-Lara or Mayweather-Alvarez), but to overturn an official verdict...unlikely. And while it's important to rid the sport of bad officials, this doesn't help Zhora in the short term. Although Showtime has reached out to Zhora and his team to invite him back on ShoBox for a future date, as we all know, losses (deserved or not) can stunt the progress of a young fighter's development. 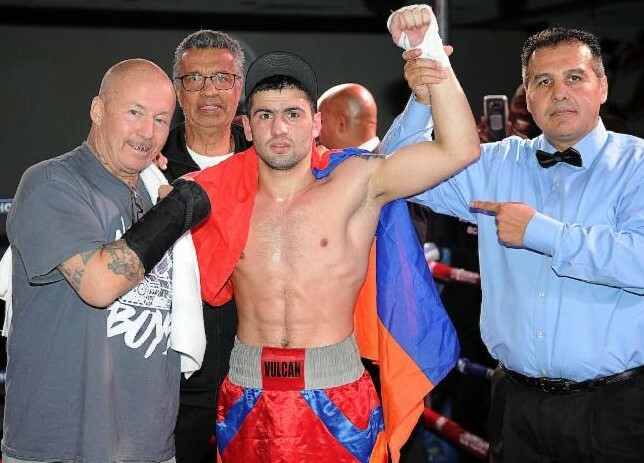 Five years ago, Zhora (then 17) was boxing in an Armenian amateur national tournament when good fortune smiled upon him. Melik Gabrielian, a trainer from Ukraine who randomly dropped in on the tournament while killing time in Armenia, really liked what he saw from Zhora. "He told me," said Zhora, "'come with me. I can make you a good pro.'" Shortly after that, Zhora started his professional career under the watchful eye of Melik and his brother Manuel, who once trained former heavyweight titlist Nikolai Valuev. Early knockouts started to come, and soon manager Harry Kazandjian was contacting Banner regarding a potential new hot prospect to sign. Now 9-1 with six knockouts, Zhora will next head back to Europe to burn off some steam. Although he has been cornered by Jerry Rosenberg during his two fights in America, he still trains with the Gabrielian brothers between fights. In Russia, Zhora will immediately start his cardio training. "I'll be going to Russia to train for a month," he said. "We'll be running 10 to 15 kilometers a day. After that, I will take a little time off in Turkey to regroup with my family and then I will be getting my visa to come back to the United States to fight." For now, the pain still lingers, and his forward trajectory has been stalled. Although Zhora may be unfamiliar with some of the cultural eccentricities of America, he grasps the reality of the Mattice fight all too well. Sadly, bad boxing decisions are a universal language in the sport, and every fighter understands the ramifications of a loss on a career. Yes, Zhora will get another opportunity, but what he thinks about right now is justice. As he waits for the IAC to rule on the fight, all he can do in the interim is to turn this misfortune into a positive, to use his experience as motivation: Run faster, train harder and wait for the phone to ring with an opportunity to set things right. Adam Abramowitz is the founder and head writer of saturdaynightboxing.com. He's a member of Ring Magazine's Ring Ratings Panel and a Board Member for the Transnational Boxing Rankings Board. snboxing on twitter. SN Boxing on Facebook.